AGLAIA (Aglaea) was one of the three Kharites (Charites) and the goddess of beauty, splendour, glory and adornment. She was the wife of the god Hephaistos (Hephaestus) and the mother of four younger Kharites named Eukleia (Eucleia, Good-Repute), Euthenia (Praise), Eupheme (Eloquence) and Philophrosyne (Welcome). Aglaia was also named Kharis (Charis, Grace) and Kale (Calé, Beauty). AGLAEA (Aglaia). Charis, the personification of Grace and Beauty. Homer, without giving her any other name, describes a Charis as the wife of Hephaestus. (Il. xviii. 382.) Hesiod (Theog. 945) calls the Charis who is the wife of Hephaestus, Aglaia, and the youngest of the Charites. (Comp. Eustath. ad Hom. p. 1148.) 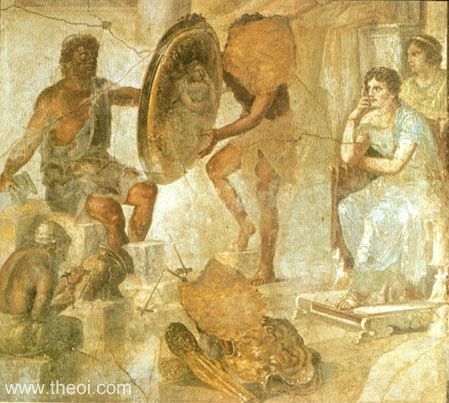 According to the Odyssey, on the other hand, Aphrodite was the wife of Hephaestus, from which we may infer, if not the identity of Aphrodite and Charis, at least a close connexion and resemblance in the notions entertained about the two divinities. Sostratus (ap. Eustath. ad Hom. p. 1665) relates that Aphrodite and the three Charites, Pasithea, Cale, and Euphrosyne, disputed about their beauty with one another, and when Teiresias awarded the prize to Cale he was changed by Aphrodite into an old woman, but Cale rewarded him with a beautiful head of hair and took him to Crete. The name Cale in this passage has led some critics to think that Homer also (Il. xviii. 393) mentions the names of two Charites, Pasithea and Cale, and that kalê should accordingly be written by a capital initial. Hearing her the renowned smith of the strong arms answered her : ‘Then there is a goddess we honour and respect in our house. She saved me when I suffered much at the time of my great fall through the will of my own brazen-faced mother, who wanted to hide me for being lame . . . Now she has come into our house; so I must by all means do everything to give recompense to lovely-haired Thetis for my life. Therefore set out before her fair entertainment.’"
"And Eurynome, the daughter of Okeanos (Oceanus), beautiful in form, bare him [Zeus] three fair-cheeked Kharites (Charites, Graces), Aglaia (Aglaea), and Euphrosyne, and lovely Thalie (Thalia), from whose eyes as they glanced flowed love that unnerves the limbs : and beautiful is their glance beneath their brows." "And Hephaistos (Hephaestus), the famous Lame One, made Aglaia (Aglaea), youngest of the Kharites (Charites, Graces), his buxom wife." "Whose haunts are by Kephissos' (Cephisus') river, you queens [the Kharites] beloved of poets' song, ruling Orkhomenos (Orchomenus), that sunlit city and land of lovely steeds, watch and ward of the ancient Minyan race, hear now my prayer, you Kharites (Charites, Graces) three. For in your gift are all our mortal joys, and every sweet thing, be it wisdom, beauty, or glory, that makes rich the soul of man. Nor even can the immortal gods order at their behest the dance and festals, lacking the Kharites' aid; who are the steward of all rites of heaven, whose thrones are set at Pytho beside Apollon of the golden bow, and who with everlasting honour worship the Father, lord of great Olympos. Euphrosyne, lover of song, and Aglaia (Aglaea) revered, daughters of Zeus the all-highest, hearken, and with Thalia, darling of harmony, look on our songs of revel, on light feet stepping to grace this happy hour . . . I come to praise Asopikhos (Asopichus), whose Minyan house, Thalia, now of your favour wears the pride of the Olympian victor." "Hiero's swift horses, Olympic runners: they sped in the company of pre-eminent Nikai (Victories) and Aglaiai (Aglaeae, Glories) by the wide-eddying Alpheus." "The Mousai (Muses) tied Eros (Love) with garlands and handed him over to Kalleis (Calleis, Beauty). And now Kythereia (Cytherea) [Aphrodite] brings a ransom and seeks to have him released." "By Okeanos' (Oceanus') daughter Eurynome he [Zeus] had the Kharites (Charites, Graces), named Aglaia (Aglaea), Eurphrosyne, and Thaleia (Thalia)." "[On Kharis (Charis), Hephaistos's wife in the Iliad :] Some said that Eurynome Titanias (the Titaness) was her mother." "[Among the images decorating the throne of Zeus in his temple at Olympia :] On the pedestal supporting the throne and Zeus with all his adornments are works in gold : . . . Hephaistos (Hephaestus), and by his side a Kharis (Charis)." "Homer, he too refers to the Kharites (Charites, Graces), makes one the wife of Hephaistos (Hephaestus), giving her the name Kharis (Charis) . . . Hence some have suspected that Homer knew of older Kharites as well. Hesiod in the Theogony says that the Kharites are daughters of Zeus and Eurynome, giving them the names of Euphrosyne, Aglaia (Aglaea) and Thalia." "Illustrious Kharites (Charites, Graces), mighty named, from Zeus descended, and Eunomia famed [here equated with Eurynome], Thalia and Aglaia (Aglaea) fair and bright, and blest Euphrosyne, whom joys delight." "[Ares is visited by a false dream :] ‘Hephaistos (Hephaestus) lies again in his bed and possesses Aphrodite, once yours! He has chased out of the house Kharis (Charis) his jealous bride.’"
He spoke, and straight through the air he plied his feet, and reached the dwelling of eager Aphrodite long before Aglaia with his pair of whirring wings." 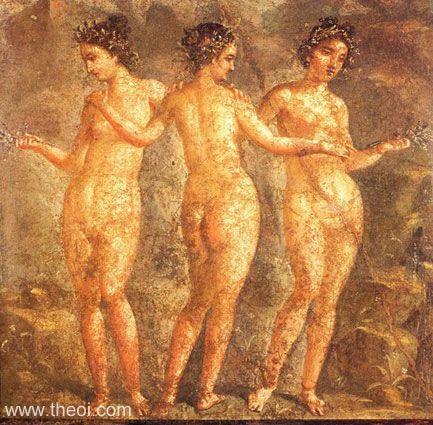 Greco-Roman Pompeii Fresco C1st A.D.
Greco-Roman Shahba Floor Mosaic A.D.
Greco-Roman Marble Statue C2nd B.C.